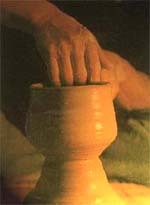 Japanese pottery market has been depending on production in foreign countries (internationalization). So that even for products of famous domestic brands, it is not clear what country they are manufactured. Mino area, Gifu, is no exception to this. Products shipped from Mino-yaki area would have a brand name "Mino-yaki" even if they have been manufactured in a foreign country. This results in damaging the image of Mino-yaki. Under a free economy, a lot of imitations are produced for competitions of items, costs, and so on. That makes consumers tend to focus more on "cost" than on "products they want to try". What we find important is understanding consumers' needs, and providing products that are cultural and makes their lives more pleasant.It is necessary to establish "Mizunami-yaki" as a "manufacturer brand" in order to clarify the responsibility for products,receive information from consumers quickly, and answer their need exactly. With the comprehensive power of quantity, quality, and material, Mizunami city is now highly competitive in the world porcelain industries. We will have a unified logotype "Mizunami-yaki", and promote manufacturing of products emphasized on porcelains and products with added value. Prices of products will be set based on the ones with higher rank grade. We will develop and sell traditional works, artistic works, and ones that express "this moment".